On the same day in 1989, forty-three infants are inexplicably born to random, unconnected women who showed no signs of pregnancy the day before. 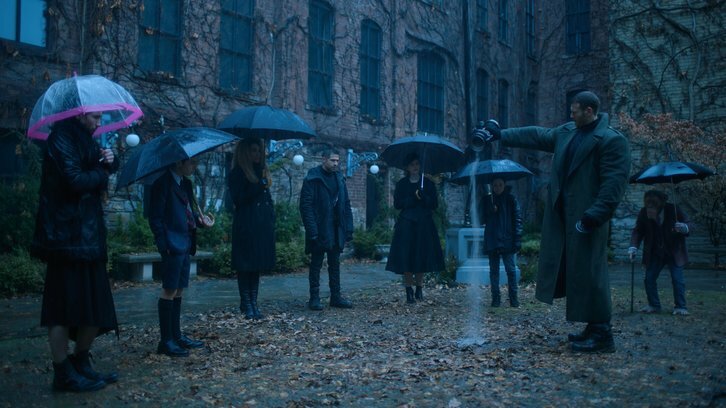 Seven are adopted by Sir Reginald Hargreeves, a billionaire industrialist, who creates The Umbrella Academy and prepares his "children" to save the world. But not everything went according to plan. In their teenage years, the family fractured and the team disbanded. Now, the six surviving thirty-something members reunite upon the news of Hargreeve’s passing. Luther, Diego, Allison, Klaus, Vanya and Number Five work together to solve a mystery surrounding their father's death. But the estranged family once again begins to come apart due to their divergent personalities and abilities, not to mention the imminent threat of a global apocalypse. Based on the popular, Eisner award-winning comics and graphic novels created and written by Gerard Way (My Chemical Romance) and illustrated by Gabriel Bá, The Umbrella Academy is a live-action series that follows the estranged members of a dysfunctional family of superheroes (The Umbrella Academy) -- The Monocle, Spaceboy, The Kraken, The Rumor, The Séance, Number Five, The Horror, and The White Violin -- as they work together to solve their father’s mysterious death while coming apart at the seams due to their divergent personalities and abilities. Published by Dark Horse Comics, the comic series garnered much praise from fans and critics alike for its alternate and twisted take on the superhero genre. The Umbrella Academy will be produced by Universal Cable Productions. Steve Blackman (Fargo, Altered Carbon) will serve as executive producer and showrunner, with additional executive producers Bluegrass Television and Mike Richardson and Keith Goldberg from Dark Horse Entertainment. Gerard Way will serve as co-executive producer. The pilot script was adapted from the comic book series by Jeremy Slater (The Exorcist). Ellen Page, Tom Hopper, Robert Sheehan, Emmy Raver-Lampman, David Castaneda, Aidan Gallagher, Mary J. Blige, Ashley Madekwe, Cameron Britton, Colm Feore, Adam Godley, John Magaro and Kate Walsh round out the cast.